One-half mile north of N.H. Route 3A., two and one-half miles west of Plymouth Village on Smith Bridge Road over the Baker River. The bridge is 149'2" long with a clear span of 140'6", has an overall width of 20'7" with a roadway width of 13'9" and a maximum vertical clearance of 12'0". The bridge was closed to traffic in May of 1991. According to W. Edward White in his book Covered Bridges of New Hampshire, a Captain Charles Richardson built the first covered bridge at this site in the early 1800s. The current bridge was built in 1850 when James McQueston hired Herman Marcy of Littleton, N.H. to frame, raise, and finish a covered bridge across the Baker River for the Town of Plymouth. The bridge was known as Smith Bridge and was the same plan and style as the one located on Pont Fayette. Pont Fayette or Fayette Bridge was a structure which spanned the Pemigewasset River between Plymouth and Holderness from 1804 until 1934. The Smith Bridge was repaired in 1940, 1949, and 1958. It was rehabilitated in 1971 at a cost of $7,876. A telltale (height barrier) was erected to protect the bridge. Signs on the bridge include, "One Lane Bridge," "One Car at a Time on Bridge" and "Speed Limit 15 MPH." The Smith Bridge was eligible for listing on the National Register of Historic Places. 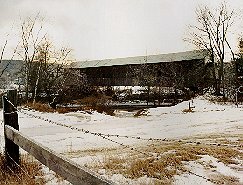 The Smith Bridge was destroyed by fire on April 16, 1993. At the time of publication, the town of Plymouth expressed their intention to replace the structure with another covered bridge.